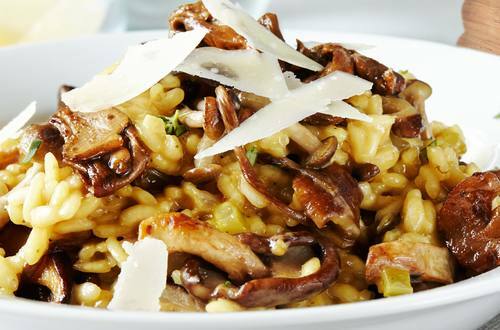 This mushroom risotto recipe is delicious. Wild mushrooms cooked with white wine, stock and creamy Hellmann's® or Best Foods® Real Mayonnaise. 1 Heat olive oil in 4-quart saucepot over medium and cook onion, celery and garlic, stirring occasionally, until onion is almost tender, about 5 minutes. Stir in mushrooms and cook, stirring occasionally, until mushrooms are tender, about 5 minutes. Stir in Knorr® Homestyle Stock - Vegetable and uncooked rice and cook, stirring frequently, until rice is opaque and Stock is melted, about 2 minutes. Stir in wine and cook, stirring occasionally, 2 minutes. 2 Add boiling water, 1/2 cup at a time, and simmer, stirring frequently, until water is absorbed, about 20 minutes. Stir in Hellmann's® or Best Foods® Real Mayonnaise, Country Crock® Spread and cheese.